Have you ever spent months on a project of some sort that had to eventually be scrapped for reasons that were beyond your control? Personally, there’s not much in life that’s more frustrating than for me to dedicate my time and energy into something and then have it not pan out. Yet it happens, and it’s such a shame to look back and see all those resources that went to waste. I’m sure you’ve had a similar experience. The truth is though, that time is a very finite resource that never moves any faster or slower for any of us. We’re all given the same amount of time in each day and have the ability to choose how we use it. So it stands to reason that we should figure out how to use it more wisely. My advice? Plan for the short-term. First, it works in the same way that accomplishing a big goal works; there’s a momentum that builds as you begin to hit a stride that has you accomplishing things on a regular basis. There’s the science behind it that says you get a nice release of endorphins and it makes you feel good about yourself, but there’s also the fact that you’re making real, tangible, progress. You’re making it regularly and hopefully, adding value in some way. If this modern-day age of reality television, 24/7 connectedness and wearable technology has taught us nothing else, it’s that things are always changing. A goal you have now may not make sense seven days from now, given your situations in life. 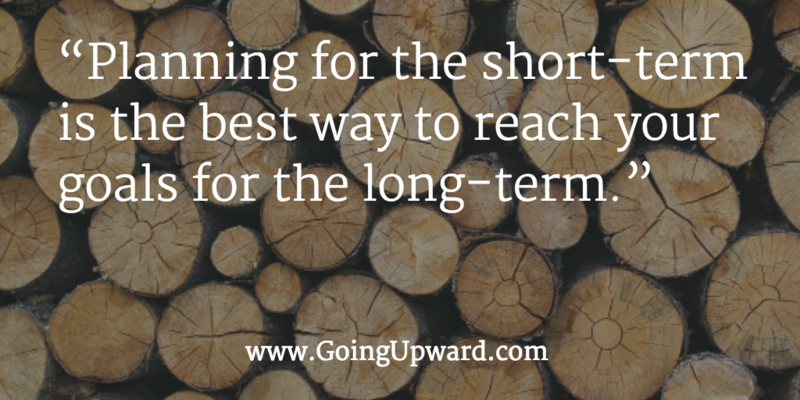 One of the key benefits to planning for the short-term is that it allows you to pivot when needed. Even if you have to abandon your plans and go another direction, you’ve not lost too much of the energy you’ve invested towards a short-term goal. How short-term are we talking? You should make your short-term plans however long or short that is most comfortable (or convenient) for you, but I and most folks I know keep it down to about two weeks. I try to keep everything I’m working on personally, in my career and socially down to this two-week timeline, and I plan things accordingly. This allows me to stay focused on fewer things, but still gives me room to get those things accomplished. Should I abandon my long-term goals? You should still have yearly goals that push your limits and get you out of your comfort zone, but even then, you should be breaking those goals down into manageable pieces that see you hit a milestone on a regular basis. In fact, this is one of the best ways to actually succeed in reaching those goals. If you don’t have something that you can measure your progress against, how do you know whether or not you’re closer to hitting that big goal? This idea of frequent, regular wins is prevalent in the process of the Agile Methodology, which I first began learning about just over a year ago. Agile has a few other elements that I really believe will serve you well if you want to begin shifting towards adopting this process for your workflow. Work in sprints. A sprint is a typical two-week period, where we’re committed to creating or fixing something and shipping it. It may be small and seemingly unimportant, but we know better. It’s getting shipped and therefore providing some sort of value to the organization. Incremental, iterative changes are king. Resist the urge to delay this beast of a project until it’s completed and finished. Understand that shipping things early and often brings value to the stakeholders faster, so figure out how you can break it down and release it in pieces if it’s especially large. Regular reviews. Stop every two weeks and review what you’ve done. Address issues that might’ve come up so that you can dedicate some time in the next two weeks to fix them. Otherwise, let’s plan something awesome for the next two weeks! It’s not perfect. It’s not meant to be! The very idea of imperfection is what this whole process revolves around! We understand that what we ship to the users, while valuable and usable, will almost certainly need improvements, no matter how long we waiting to release it. The difference here is we get to quickly respond directly to feedback from actual users, rather than trying to guess where the flaws are and fix them. This brief overview doesn’t really do much justice to understanding how we’re shaking things up at Upward Media in order to provide the best experience for our clients, but the principles here can be applied to virtually any scenario, whether it be family or personal projects or your own job.